A survey carried out in 2007 by leading US-based gay company Community Marketing, which identified the most-visited international destinations for US gay travellers, rated the Canadian city of Vancouver in the top five, behind London, Puerto Vallarta and Paris. It was just ahead of fellow Canadian cities Montreal and Toronto, despite the fact that both of these boast larger populations (Toronto has 5.5 million to Vancouver's 2.2 million). 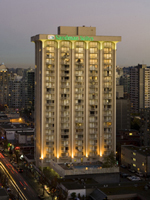 Arriving at my hotel - the Sandman Suites on Davie Street - I began to get an inkling as to why this picturesque city, which lies on the far west coast of Canada, just above the border with the U.S, should be so attractive to gay visitors. For a start, there appeared to be rainbow flags everywhere, including pretty rainbow banners attached to the streetlamps. 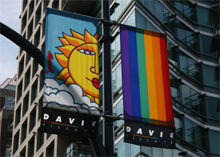 This gay-friendly branding extended for several blocks along Davie Street, the heart of the city's gay district. In fact, most areas of downtown Vancouver are similarly branded - which along with the fact that the city's laid out on a grid system, makes it rather easy to navigate. Besides the rainbow flags of Davie Street, there are banners in the Yaletown district, China town, entertainment district and heritage district, so it's difficult to get lost. Because of its grid system, downtown Vancouver reminded me a little like a mini-Manhattan. Small skyscrapers dot the skyline, and the city even boasts its own huge green retreat. Stanley Park, to the north-west of the downtown district - overlooking the Pacific's Burrard Inlet - is North America's third largest park, and spread over 400 hectares, dwarves even NYC's Central Park in stature. It brings a taste of the wild outdoors to the very heart of the city, with deep woodland in its interior and five miles of sea walks along its outer edge. In fact, Vancouver has a refreshingly outdoors feel to it. Coming from London, one is used to pollution, congestion charges and a concrete sprawl for as far as the eye can see. The view from my 23rd floor suite included not only downtown Vancouver, but also the beginning of the Coastal Mountains overlooking the north of the city, and the Pacific Ocean on the west. South of Stanley Park are beaches overlooking English Bay, which are packed with sunbathers during the summer months, while in the winter it's just a 15-minute taxi ride to the gondola at the foot of Grouse Mountain. This will carry you leisurely to an elevation of 3,700 feet for snowboarding, skiing and other wintery pursuits. Alternatively, head up there in the summer for the daily lumberjack demonstrations! If you're only in town for a few days, the best way to get around is to purchase a ticket with the Vancouver Trolley Company (www.vancouvertrolley.com). These old-fashioned trolleys follow a two-hour route around the downtown district, taking in all the main tourist sites and places of interest. You can hope on and off, safe in the knowledge that there will be another trolley every 20 or so minutes. Tickets costs $35 (about £20) and are valid for two days. Touristy highlights include the shops along Robson and Denman, the historical Gastown district (the oldest part of the city), the aforementioned Stanley Park (with stunning views over the Lions Gate Bridge and Vancouver Aquarium), and Granville Island, with its fresh food markets. The rejuvenated Yaletown is a bit like Hoxton; a former warehouse district that now boasts a wealth of trendy shops, furniture showrooms, grooming spas and classy restaurants. The city's China Town is the second largest in North America (after San Francisco), and fans of sushi and noodles will be spoilt for choice across the city. Also worth checking out is the Vancouver Art Gallery, the huge Vancouver Library, and the shops, restaurants and IMAX cinema at Canada Place - all of which are on the trolley routes. The aforementioned Davie Street might seem a little shabbier than other parts of the downtown district, but its home to all the main gay businesses and attractions - highlighted by the rainbow banners and pink bus stops! Visitors would be wise to begin their tour by visiting the Little Sister's Bookstore (1238 Davie Street, www.littlesisters.ca). This large outlet celebrated its 25th anniversary in 2008, and stocks a wide-range of international gay magazines and local press - pick up a copy of the excellent Gay Friendly Vancouver (www.gayvan.com) for full and comprehensive listings. Bars to check out include the manly Pumpjack (1167 Davie Street, www.pumpjackpub.com) - particularly for its busy Sunday evening Kegger session - and the Majestic (1138 Davie Street, www.majesticvancouver.com), for its nightly entertainment and promotions. Then there's the Fountainhead (1025 Davie Street, www.fountainheadpub.com, and sports-oriented Score (1262 Davie Street, www.scoredavie.com). Perhaps it's down to the green, outdoorsy nature of the city, but everyone seems to be a sports fan, and many of the gay bars have video screens to show the local Ice Hockey matches! Davie Village Central (1141 Davie Street, www.davievillage.ca) is a long-running community cafŽ and bar that now hosts monthly club sessions for the likes of the local bears, while the multi-floored Numbers (1042 Davie Street, www.numbers.ca) hosts weekly karaoke and amateur strip. Do also check out the upmarket lounge bar Oasis (1240 Thurlow Street, www.oasisvancouver.com), particularly for the riotous Tuesday night 'Name That Tune' session with the lovely Tony Montana. For more late night action, head to Celebrities (1022 Davie Street, www.celebritiesnightclub.com), a metrosexual-flavoured gay haunt for a youngish crowd. Five minutes south is Odyssey (1251 Howe Street, www.odysseynightclub.com), which is open till late seven nights a week with regular drag shows, go-go displays and thumping dance sounds. August is a particular gay month to visit the city, as it also hosts the annual gay film festival (14-24 August), and the annual Pride celebrations (3 August), including a Picnic In The Park on 26 July and Sunset Beach Festival. With an abundance of clean air and stunning scenery - from the beaches to the parklands - coupled with all the amenities and attractions of a modern urban metropolis, Vancouver provides an enviable quality of life to anyone who chooses to make it their home. It's also provides a laid-back, fun-packed escape for anyone seeking a more short-term British Columbia experience. Located in the heart of the gay village, with 195 fully-furnished suites (including living room, bedroom, bathroom and kitchen area), a health spa and Moxie's grill and restaurant. Ask for a room on one of the higher floors - they boast amazing views (pictured right). * A Kettle Of Fish, 900 Pacific Street, V6Z. One of Vancouver's best seafood restaurants. www.akettleoffish.net.